My sermon this Sunday is based on Matthew 14:22-33. It pays to keep this in mind this Sunday, when I’ll be preaching on Matthew 14:22-33, a passage in which both Jesus and Peter walk on water. † C.S. Lewis, Miracles (New York: HarperOne, 1996), 75-6. 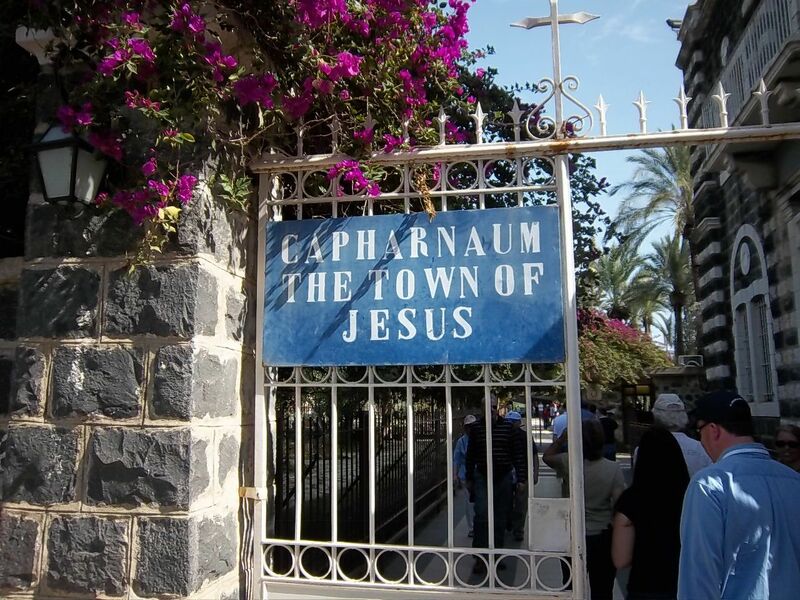 Jesus moved from his hometown of Galilee to Capernaum, where he likely worked as a carpenter. Mark Burgess told me the story of his first Sunday at Hampton UMC. It turns out it also corresponded to the first day of Vacation Bible School. So Mark got up and preached what he thought was a good sermon, but he had barely finished his benediction, he said, when these people marched up and took the pulpit away. 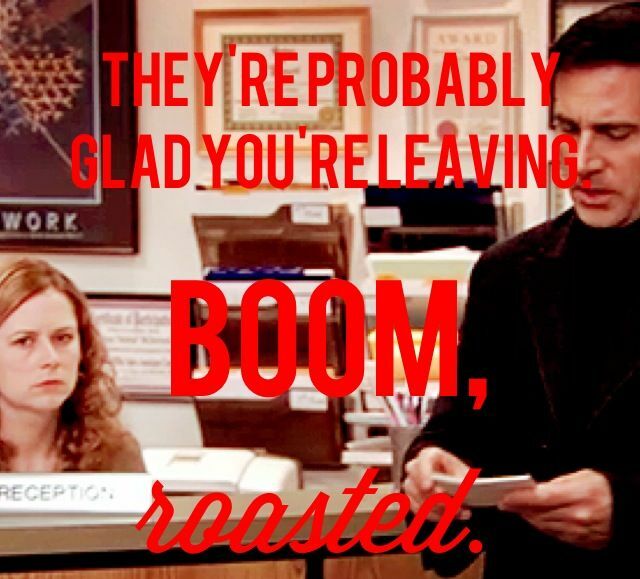 And Mark thought, “Was I that bad? Are they not going to let me do this anymore?” I am so grateful to Mark for his faithful, effective, and grace-filled leadership over these past seven years, and his love and support of me during this transition. He has left a strong foundation for ministry on which each of us can continue to build. Praise God? So… Anything interesting in the news this week? Christianity Today posted a must-read article from Andy Crouch yesterday whose main point I’ve argued for a while (though not nearly as well): that embodied sexual differentiation matters to God. Christians will have to choose between two consistent positions. One, which we believe Christians who affirm gay and lesbian unions will ultimately have to embrace, is to say that embodied sexual differentiation is irrelevant—completely, thoroughly, totally irrelevant—to covenant faithfulness. It is no accident that as normative sexuality has been redefined, from an essentially exterior reality uniting male and female bodies to an essentially interior reality expressing one’s heart, the charges of bigotry have been heard more fiercely against those who hold the traditional Christian view. How dare we Christians speak against any person’s heart? For behind the dismissal of bodies is ultimately a gnostic distaste for embodiment in general. To uphold a biblical ethic on marriage is to affirm the sweeping scriptural witness—hardly a matter of a few isolated “thou shalt not” verses—that male and female together image God, that the creation of humanity as male and female is “very good,” and that “it is not good that the man should be alone” (Gen. 2:18, NRSV). All of us know, in the depths of our heart, that we are queer. Our yearnings, especially those bound up with our sexuality, are hardly ever fully satisfied by the biblical model of one man and one woman yoked together for life. Every one of us is a member of the coalition of human beings who feel out of place in our bodies east of Eden. And every one of us has fallen far short of honoring God and other human beings with our bodies. Many people, when confronted by the gravity of their own recent sin, feel as if God were so disappointed with them that he couldn’t possibly still love, forgive, or accept them. If this describes you, let me ask: Did God ever love, forgive, or accept you? Because if God ever did, then he did so with the full knowledge of all the sins of your life—past, present, and future. Or think of it like this: Have there been moments in your life when you felt especially loved and accepted by God—perhaps at your Christian conversion, baptism, or confirmation? Then consider this: you have done nothing since then that has surprised God. In that moment when you felt God’s pouring out his love on you, he was doing so knowing all the ways that you would rebel against him in the future. Yet he loved you anyway. God in his foreknowledge knew that when he drew me into his family, I would lust and lie and gossip and slander and practice all manner of immorality through the years ahead. He knew the particular sins and the particular people I would sin against. 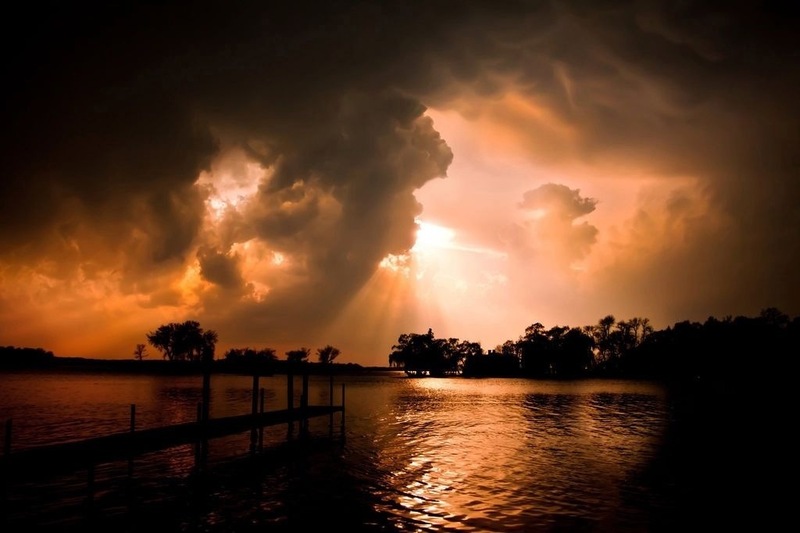 He has known for some time the particular evil inclination that I recognized for the first time yesterday in worship. He knows this morning how I’m going to fail him before the morning is out. 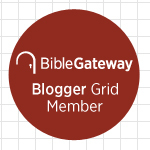 Yet despite his complete knowledge of the darkness of my heart and the wickedness of my future, he accepted my initial sinner’s prayer and has held me to that commitment. He has remained committed to me despite his full knowledge of my deeds, words, and motives, past, present, and future. As Paul put it, “If we are faithless, he remains faithful—for he cannot deny himself” (2 Tim. 2:13, esv). All I can say to this is, Amen and Hallelujah. 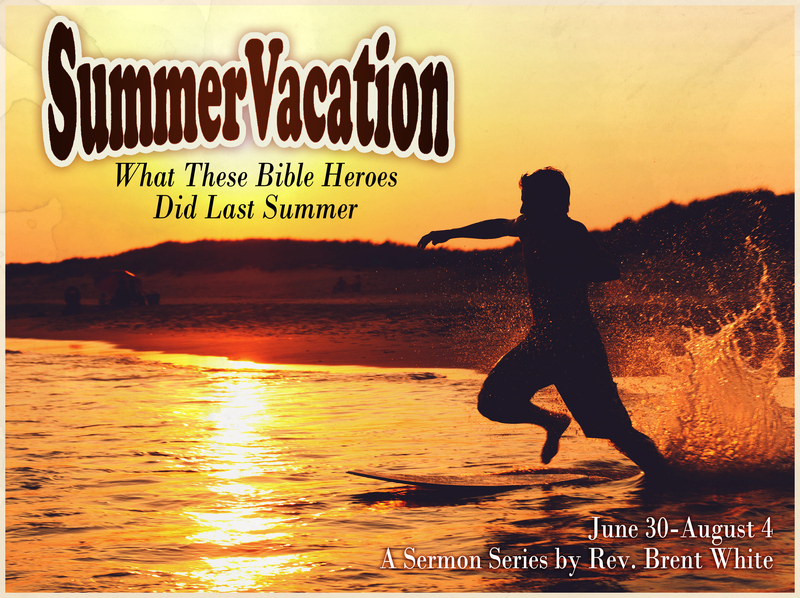 This Sunday at Hampton UMC, I’m beginning a summer sermon series entitled “Summer Vacation: What These Bible Heroes Did Last Summer.” Each week I’ll preach a passage of scripture related to an activity or experience we often associate with summer. Ruins of houses in Capernaum. The houses were made of stone with thatched roofs. Beneath this plexiglass floor sits what is believed to be Peter’s house, at which Jesus healed Peter’s mother-in-law in Mark 1:29-31. Ruins of the first-century synagogue in Capernaum, where Jesus preached in John 6:59. I preached my inaugural sermon at Hampton UMC yesterday on Mark 2:1-12. I called it “The Main Thing.” I reflected on the surprise or disappointment that the four friends likely felt when Jesus told their paralyzed friend, “Son, your sins are forgiven.” Surely they wanted Jesus to do for their friend what he had done for so many people in Mark 1: they wanted Jesus to heal the man physically. Who said anything about forgiveness? Forgiveness of sins, however, is the main thing. It’s the reason Jesus came into the world. The promise of forgiveness of sins seems both too little and too much: too much, because it trespasses upon God’s exclusive sphere; too little, because there seems to be no thought of Israel’s concrete suffering or its true need for salvation… Certainly it does not match the immediate expectations of Messianic salvation nurtured by men who felt oppressed not so much by their sins as by their sufferings, their lack of freedom, the wretched conditions of their existence. Man is a relational being. And if his first, fundamental relationship is disturbed—his relationship with God—then nothing else can be truly in order. This is where the priority lies in Jesus’ message and ministry: before all else, he wants to point man toward the essence of his malady, and to show him—if you are not healed there, then however many good things you may find, you are not truly healed. Like most preachers, I worry about repeating myself—repeating a theme, an idea, a sermon illustration. I don’t want to be boring or predictable. I also want my sermons to be practical and relevant—”the Good News you can use.” But this message of forgiveness of sins, made possible by the cross of Jesus Christ, is the central message of Christianity. The message of the cross can’t be repeated often enough. No message is more relevant for our lives. 1. Joseph Ratzinger, Jesus of Nazareth: The Infancy Narratives, trans. Philip Whitmore (New York: Image, 2012), 42-43. 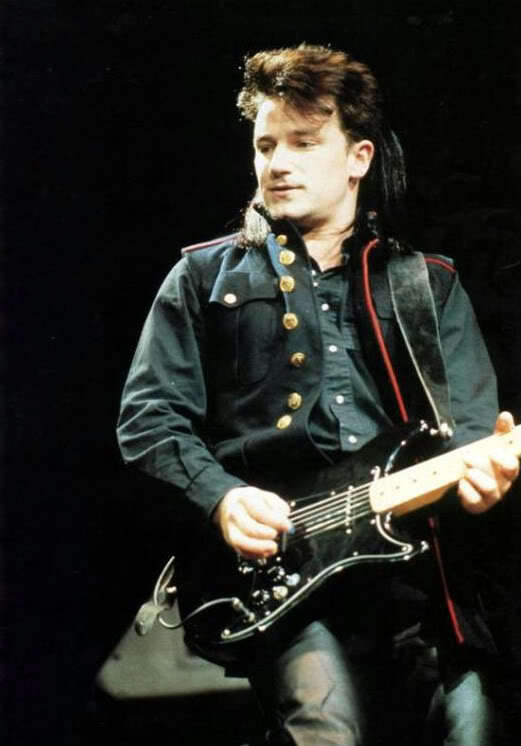 I love the fact that this very young Bono is playing a Fender Lead II. That’s my guitar! Last week, Frank Viola blogged about a biography of Bono written by an author named Michka Assayas. I loved the following excerpt from an interview, in which Bono articulates the meaning of the Atonement about as well as anything I’ve read. Vinebranch constantly challenged me to step outside of my small and safe comfort zone. The following is my original sermon text with footnotes. 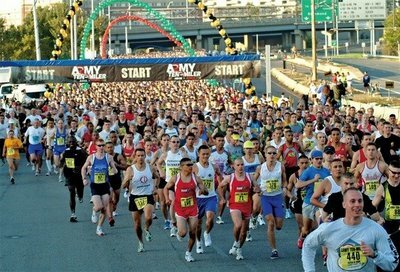 Some of you, I’m sure, will be running the Peachtree Road Race in a couple of weeks. I’ve run it several times in the past, and I’m struck by the “party atmosphere” of it: It’s a big celebration more than anything. It doesn’t really matter how fast we run it—or even whether we run it at all. The only thing that matters is that we cross the finish line—whether running, walking, crawling, sliding, skipping, rolling, or somersaulting—so that we can get the big prize: the T-shirt. Monday afternoon. The end of one chapter. One of the highlights from yesterday was playing one last time with the Vinebranch Band. I sang the Daniel Amos song “Joel” and improvised a guitar solo on my Fender. My own daughter made this for me! Can you believe it? Stephanie Newton and John Ramminger, not to mention all the people in front of the camera, helped to put together this going-away video, which was shown in Vinebranch last Sunday. Enjoy! 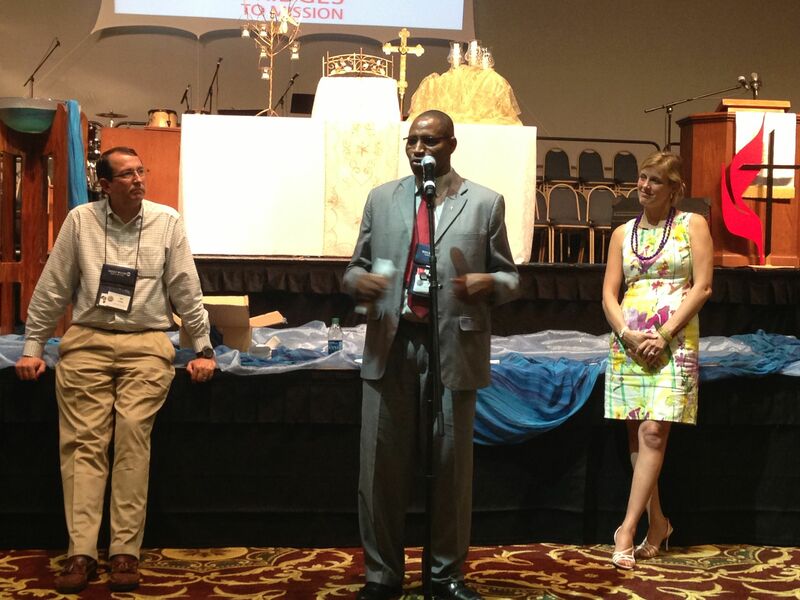 Kenyan UMC pastor Paul Matheri speaks at the North Georgia Annual Conference in Athens last week, flanked by my friends Bill and Chat Coble. The theme of last week’s North Georgia Annual Conference in Athens was “Bridges to Mission.” My friends Bill and Chat Coble, UMVIM missionaries, talked to the 3,000 or so people there about their work in Kenya. They also had a question-and-answer session last Wednesday evening, at which Kenyan pastor and district superintendent Paul Matheri spoke. Yesterday, Bill and Chat gave a testimony in both Vinebranch services about their work in Kenya—and I’m sure they inspired some of my congregation as much as they’ve inspired me. They are two of my heroes. 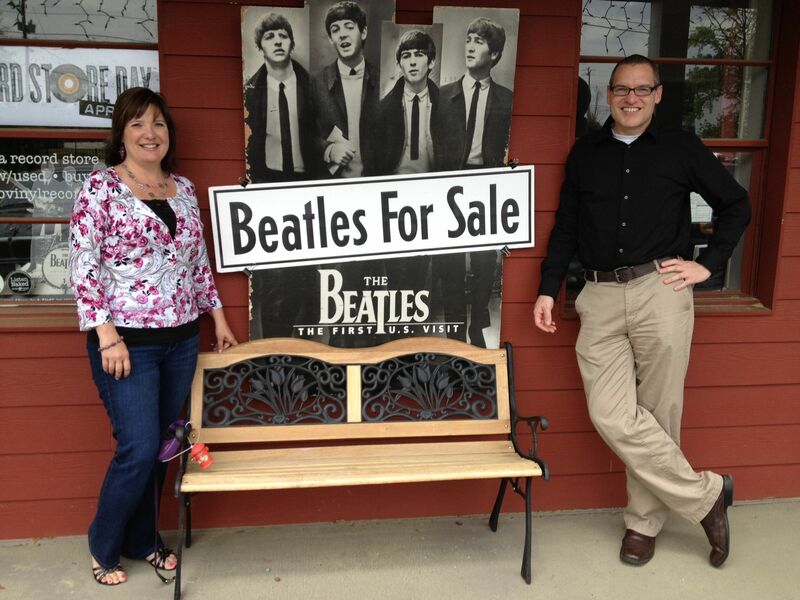 Find out more about their ministry, Start With One Kenya, here. I put together the following video, which I showed in yesterday’s services. In the video, Chat is teaching a church in an IDP camp about the life-saving water filters that their ministry distributes.